Elders, traditionalists keep to sovereignty and deny Canada’s offer for “municipal” powers. On Saturday, March 14, the Líl’wat people voted against a Land Code proposed by their elected Chief and Council. “Way to go Líl’wat. It’s not about winning or losing the vote. It’s about the Fight for our Rights. No means that our Sovereignty and our Unceded territory stays intact. We keep our strength. We can keep on keeping on fighting for our Inherent Sovereign Rights. Líl’wat is one of dozens of Indigenous communities involved in the development of on-reserve Land Codes. These are specific agreements between First Nations and Canada which, if ratified by the community, turn administration of Indian reserve lands over to the First Nation’s elected Council. Land Codes set out dozens of rules and procedures to streamline and standardize their decision making about reserve lands, and those decisions are then recognized by Canadian courts as authoritative. Without a Land Code, assent by the Ministry of Aboriginal Affairs and Northern Development, Canada, is required before First Nations can proceed with their decisions. That is perhaps the most significant reason for the “no” vote, but it is not the only one. Land Codes come with a substantial budget for development and promotion towards community ratification, but those who seek further scrutiny or oppose the Land Code are not funded to promote their arguments and investigations. Looking more closely at the Land Code, as people in Lil’wat did on their own time and resources, there is very little financing indeed for implementation of the new administrative powers. In the first two years of implementation, Líl’wat would have received $280,000 for administrative operations, including transition funding. After that, federal funding to the Líl’wat administration of its reserves would have been at the discretion of Parliament. 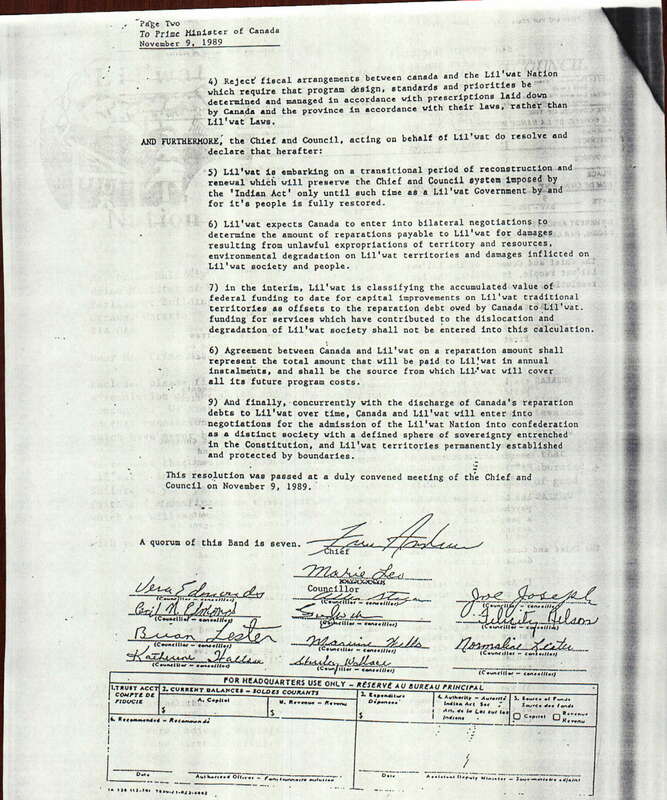 The Land Codes introduce a new class of person, a First Nations Citizen, which calls to mind the incorporation process of the Alaska Native Claims Settlement Act, 1971. Under that Act, only people alive at the time of signing could be shareholders! Similarly, traditional customs of land ownership and succession appear to be endangered species within the Land Codes which narrowly define exchange of Certificates of Possession and transfers of lands at death, as well as other existing, more traditional, mechanisms for land transfer. Several First Nations in BC have voted down Land Codes because of these and other faults. The promotional materials remained unhelpfully vague about the exact nature, strength and scope of the administrative powers under the new Land Code, but each video includes encouragement from the Chief to vote “yes.” Those people who were skeptical about ratifying the Land Code noted that the Band Council did not produce materials on any potential negative impacts whatsoever. Many Líl’wat people used their own money and time to hold meetings, print letters and distribute assessments of the Code. Those people would not have agreed with Chief Louie’s point of view that only by agreement with Canada would it be possible for themselves, an Indigenous People, to exercise their “rightful” jurisdiction, self-governance or laws. This Land Code is like signing a Treaty with the Government. We do not need to sign a Treaty with them. If we implement the Land Code, we’ll be giving all of our power over our lands to the Government. They’re trying to implement these Land Codes because the B.C. Treaty system has fallen apart. …Simply put…the Land Code is an attempt by Canada to reduce native nationhood to less than municipal status! Don’t fall for this trap!! The Land Code will not give us our own Government. We already have sovereign reign over our unceded territory. If we say yes to the Land Code we will be acknowledging that the Government and DIA have jurisdiction and power over our lands. But, they don’t! Why give up 100 % jurisdiction and sovereignty just so they can give us a little bit of jurisdiction back. It just does not make sense. Líl’wat has 3,000 hectares of reserve lands marked off by Canada. The traditional territory is approximately 800,000 hectares, a quarter the size of Vancouver Island. Statements by the no-land-code coalition. Elected leaders in Líl’wat often made statements about how the Land Code would help strengthen traditional governance and principles. The Council’s official summary of the purpose and guiding principles of the Land Code says, “The Líl’wat Nation wishes to preserve, protect and promote the health, heritage, culture and traditions of its Citizens through its strong connection to the land and resources.” Many voters clearly took these claims at face value or were unable to see that such statements are not borne out by the content of the legalistic, hard to read Land Code document. A brief introduction, before the preamble, in the Land Code is the only part which is written in Ucwalmícwts, and it appears to have been translated from English to the Líl’wat language. In fact the English version is printed first. This statement is not supported by any part of the actual Land Code document – there is no reference to ownership of land except that Canada will “continue to” hold title to Líl’wat reserve lands. There is also no actual paragraph, article or clause in the Land Code that refers to any part of traditional Líl’wat laws. The phrase “traditional Líl’wat territory” does not appear in the Land Code. 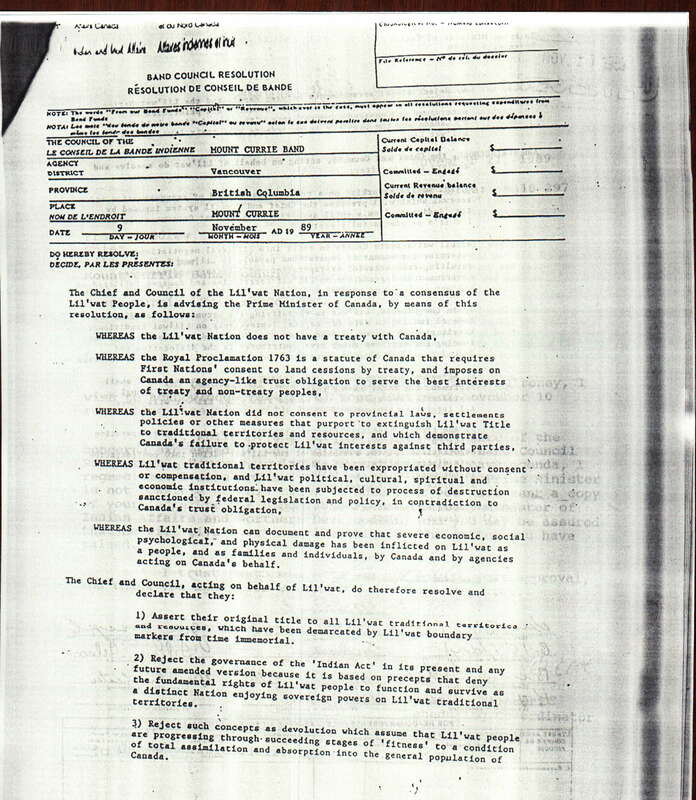 While the text of the Land Code states that the document was “drafted by the Citizens of the Líl’wat Nation,” this Land Code is mostly identical to the Squamish Land Code (which was voted down in 2011) – and all the other Land Codes passed by Indigenous Communities since signing Framework Agreements with the federal government in the 1990s and early 2000s. Several key features in common to all Land Codes are: executive powers over land-use decisions shall be held by a small committee in certain circumstances; in all Land Codes the people of the community have suddenly become capital-C “Citizens of X First Nation.” In each case, “this Land Code is hereby enacted as the fundamental land law of the (X) First Nation.” Every Land Code addresses the same areas: matrimonial property rights; the same law making powers; federal expropriation of First Nation Lands; First Nation government expropriation of community lands; land lease procedures. In fact, the Table of Contents of all the Land Codes have the same subjects in the same sections in the same order – and they all say that the Code was written by their citizens. Each Land Code states that it is the most important source of land law in the First Nation. The Codes are deemed to have replaced the traditional laws. The dozens of First Nation Land Codes currently in progress are products of Canada’s First Nations Lands Management Act, which was supposedly formed in consultation with over a dozen First Nations late in the 1990s. The delegation of administrative land management powers described in the Codes is dependent on the transfer of administration of the Indian Reserves from Her Majesty in Right of Canada to the First Nation. Most objections to the land code process are centered on that point. In order for a First Nation to begin to manage its reserve lands, it must go through the ritual of receiving title to its reserves from Canada. This action is explicit: by allowing Canada to give land title to an Indian Band, or First Nation, on its own nation’s traditional territory, the voting community is participating in the myth that Canada somehow gained title to those lands and is in possession of them now. That is an idea which cannot be true in British Columbia, where there have been no sales of traditional territories by Indigenous Peoples to Canada or to Great Britain. The ratified Land Code would also have released Canada from any liabilities for administration on Líl’wat reserves from the date the Land Code came into effect. The fundamental objective of the state of Canada in the Land Code process, as with the BC treaty process and the suite of legislation restricting First Nations in Bill C-45, is to have every First Nation operate as a municipality. The lawfirm Ratcliffe and Co. prepared the “municipal” diagram of Lil’wat featured with this article: that is Canada’s vision for Indigenous Peoples. Total economic and cultural assimilation. The Land Codes have been criticized for their immediate effect, and apparently their most urgent purpose, of allowing an influx of corporate and industrial development on reserves. This might have been a development which Canada could be criticized for allowing, considering the small size of Indian reserves in question and the pressing need for community development on whatever lands are ‘available.’ Canada might have trouble justifying the leasing of those lands, as administrator of the Indian reserve, when other priorities as housing are so obviously pressing. When First Nations oversee and approve development on their reserves, even if it is an action forced by poverty, those approvals will not be criticized because there is no conflicting fiduciary obligation. The First Nation appears to be making its own decision. Indian reserves across BC hold small amounts of undeveloped lands very near urban centers where developers and industry are running out of affordable land options. Impoverished Indian reserves are a perfect, i.e. desperate, landlord. The Land Code provides extremely favourable terms to such third parties, saying that third party interests cannot be adversely affected except by their agreement. This is possible because in the Land Code, Canada holds title to the Indian reserves. “This amounts to yet one more trick or fraud to have Líl’wat people give up our true position as members of a free and independent state with full authority over our traditional lands. In voting ‘yes’ for the land code, we would be acquiescing or accepting Canada’s claim of sovereignty over us and our limited reserve which our ancestors knew in 1911 to be unlawful. Dozens of First Nations in BC are involved in this stage of the Aboriginal Horizontal Framework: Lands and Resources. Canada’s legislation to enable this devolution of the Indian Act is the First Nations Land Management Act. It defines the rules and procedure by which Canada will allow nations to administer reserve lands, as well as identifying the acceptable authorities to whom it will delegate that power. The specific agreements relating to administration of Indian reserve lands are called “Land Codes.” Currently the Ministry of Aboriginal Affairs and Northern Development, Canada (previously the Department of Indian Affairs), approves or denies every single land-related decision put forward by a First Nation in a Band Council Resolution. Such a Resolution is an action taken by the elected Chief and Council on reserve. The other areas addressed by the Aboriginal Horizontal Framework (AHF) are Education, Governance, Housing and Infrastructure, Finance and Taxation, Health, and Children and Families. The AHF was presented to Canada’s Treasury Board in a formally commissioned inventory and classification of all monies spent by the federal government in Indian Reserves. While First Nations engaged in the BC Treaty Commission are designing Final Agreements which will release Canada from its current obligations in all these areas, other First Nations are negotiating delegated powers over education, through the “Education Jurisdiction Agreements,” and Children and Family services, most notably through the Aboriginal Peoples Family Accord – or delegated childcare agencies. In each area, the federal government seeks release and indemnification by the First Nations in the specific area. So if an education jurisdiction agreement is ratified, for example, the federal government is no longer responsible for providing education on that Indian reserve. The education agreements come with provincial funding and oversight. With each “jurisdiction” agreement under the AHF categories, the First Nation assumes control of delivery of services – often with less than five years’ worth of financial certainty for their operations, and always without adequate, independent sources of revenue to sustain those operations. The AHF set out a seven-section model of pursuing First Nations’ incorporation and release of federal fiduciary obligations, a plan which appears to favour the federal government disproportionately. Interestingly, the government of Australia is pursuing an identical set of these seven areas of jurisdictional delegation, essentially treaty-making on an issue-by-issue basis. But the piecemeal treaties never address historic harms, nor the prospect of a viable future, nor the outstanding question of ownership of the other…99.5% of the Indigenous People’s land base. The “jurisdiction” agreements (such as the Land Codes) do not feature schedules of reparations and compensation for past harm which might offset the present day poverty and lack of human resources, lands resources, and cultural resources which have resulted from Canada’s genocidal policies. If not the Land Code, then what do people want? “We want Canada to acknowledge that we are the rightful owners of our traditional territory, we have never ceded or surrendered the rights to our traditional territory. And as a people we are in the process of re-forming our own government, envisioning our flag, and creating the declaration of the Líl’wat People. We want our nationality. We’re saying Canada has no right to force a nationality upon us. We are Líl’wat. We have never ever said that we are Canadian, but Canada has forced that upon us. On the same day as the Land Code vote, Lil’wat went to the polls to elect the Band Council, Political Chief and Cultural Chief. On that Saturday, Dean Nelson was voted in as Political Chief, while Phillips lost. Former Chief Leonard Andrew was elected to the new position of Cultural Chief. The painful dilemma facing Indigenous nations is a question of fighting for the full rights of their Peoples, and suffering the sell-out-or-starve-out tactics of the colonial governments, or trying to gain footholds in slippery-slope agreements like Land Codes where too much power is conceded to the state, in exchange for too little money too late. They understand what the people before us did to protect our territory. It adds to the continuation of the protection of our territory, continuing from the 1911 declaration – which was put in place to protect us – whereas a “yes” vote would have surrendered all that. Something else the ‘no’ vote did was it woke up our young people. They noticed that the elders were not getting paid to do those meetings, they are doing it because they know they have to protect the territory for the next generations. Chief and Council do not speak for Líl’wat Nation! Chief and Council only speak as wards of the State. They are not a legal entity!! Assert their original title to all Líl’wat traditional territories and resources, which have been demarcated by Líl’wat boundary markers from time immemorial. Reject the governance of the ‘Indian Act’ in its present and any future amended versions because it is based on precepts that deny the fundamental rights of Líl’wat people to function and survive as a distinct Nation enjoying sovereign powers on Líl’wat traditional territories. Reject such concepts as devolution which assume the Líl’wat people are progressing through succeeding stages of ‘fitness’ to a condition of total assimilation and absorption into the general population of Canada. Reject fiscal arrangements between Canada and the Líl’wat Nation which require that program design, standards and priorities be determined and managed in accordance with prescriptions laid down by Canada and the province in accordance with their laws, rather than Líl’wat laws. Líl’wat is embarking on a transitional period of reconstruction and renewal which will preserve the Chief and Council system imposed by the ‘Indian Act’ only until such time as a Líl’wat Government by and for its people is fully restored. Líl’wat expects Canada to enter into bilateral negotiations to determine the amount of reparations payable to Líl’wat for damages resulting from unlawful expropriations of territory and resources, environmental degradation on Líl’wat territories and damages inflicted on Líl’wat society and people. In the interim, Líl’wat is classifying the accumulated value of federal funding to date for capital improvements on Líl’wat traditional territories as offsets to the reparation debt owed by Canada to Líl’wat. Funding for services which have contributed to the dislocation and degradation of Líl’wat society shall not be entered into this calculation. Agreement between Canada and Líl’wat on a reparation amount shall represent the total amount that will be paid to Líl’wat in annual instalments, and shall be the source from which Líl’wat will cover all its future program costs. And finally, concurrently with the discharge of Canada’s reparation debts to Líl’wat over time, Canada and Líl’wat will enter into negotiations for the admission of the Líl’wat Nation into confederation as a distinct society with a defined sphere of sovereignty entrenched in the Constitution, and Líl’wat territories permanently established and protected by boundaries. This resolution was passed at a duly convened meeting of the Chief and Council on November 9, 1989. A quorum of this Band is seven. We, the People of the Líl’wat Nation declare that our land and rights as a Nation have never been relinquished by ourselves. The Creator placed us here on our land with the right to self-determination. The right to self-determination and the right to exist as a people is sacred in our way, and we believe we have that right. Canada’s unilateral action in patriating its constitution without the consent of the Indian people and its blatant disregard of rights to self-determination of Indian People is regarded by the Líl’wat Nation as a bold and callus act against sovereign people. We will not be invitees to a conference where our rights as a sovereign people is to be discussed. Our attending such a conference will be as equal participants. Lil’wat People’s participation must be full, equal and ongoing at all levels of discussion whether preparatory or otherwise. Our representation will be chosen by our people and not by anyone or by any other colonial power or government. No decision affecting Lil’wat Peoples’ rights shall be made withut first receiving our consent and bearing the Lil’wat Government’s seal. Lil’wat people will decide how our consent is to be given. 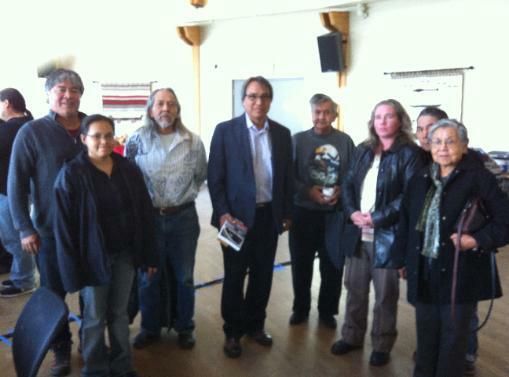 Lil’wat delegation meeting with UN Special Rapporteur on the Rights of Indigenous Peoples, S. James Anaya, October 10, 2013, Musqueam.